If you do not speak or understand Russian, the Moscow Metro can seem complicated to use. However, when you begin using it you will quickly realize that in reality it is very simple. 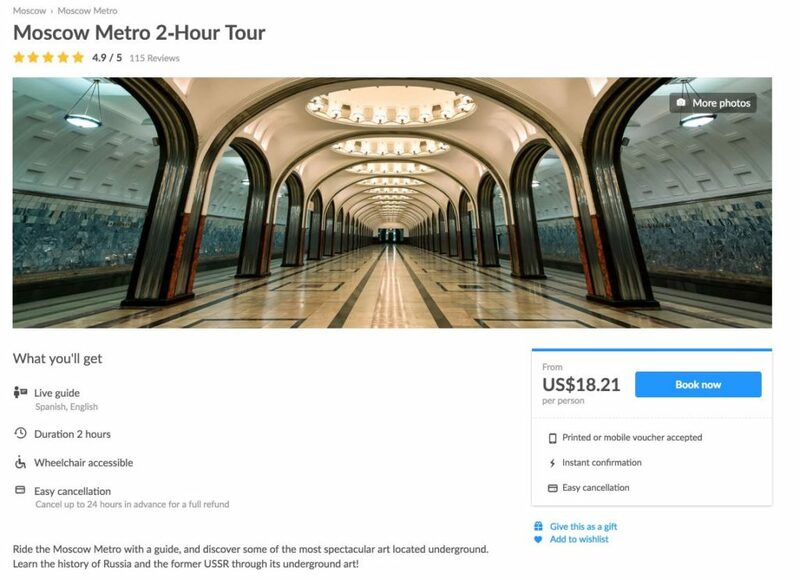 Moreover, the Moscow Metro is also an important tourist attraction due to the beauty of some of the stations. I will explain to you what stations are worth a visit. 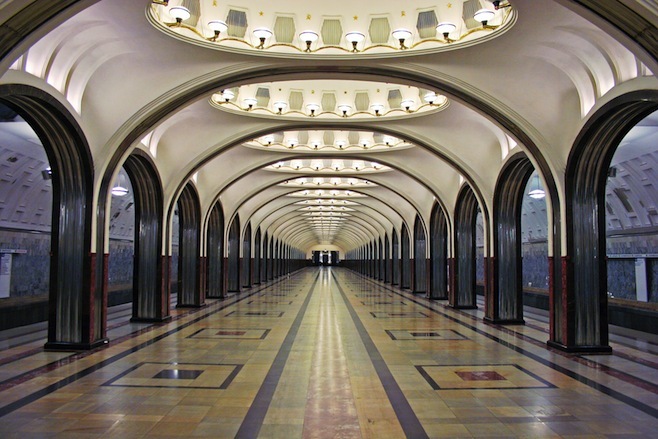 The Moscow Metro (also known as the People’s Palace) was inaugurated in 1935 in the era of Stalin. It is one of the biggest and densest in the world. 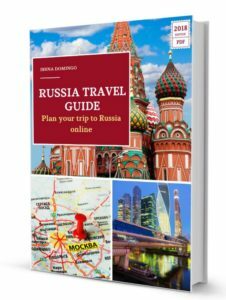 It connects the city center with the industrial and residential areas and allows you to travel quickly and easily if you are visiting Moscow. The deepest station, at 84 meters below ground, is Victoria Park (Park Pobedi), where you can find the longest escalator, at 126 meters long. The average frequency at which the trains pass is 90 seconds (in the centrally located stations it’s even more frequent). It’s not worth running if you hear a train arriving. Official English version (PDF, 5,2 Mb). 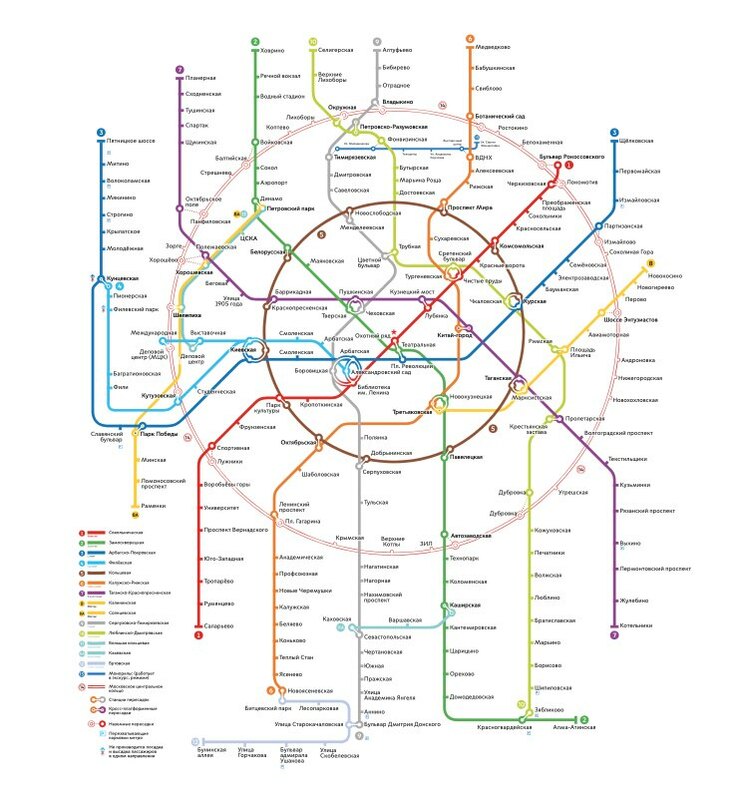 I would advise you to print this version, although you can also find copies of the map in the Moscow Metro as well. 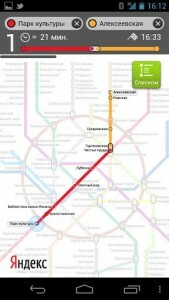 Interactive map of the Moscow Metro in order to calculate your route. Mobile applications: Yandex Metro is a free app that is extremely useful and is not necessary to use with an Internet connection in order to look at maps and calculate routes. It is available for Android and iPhone and also offers a web version in English. 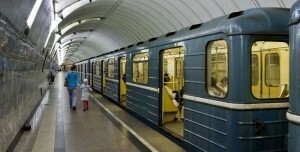 Moscow Metro Schedule: the majority of stations are open from 5:30AM until 1:00AM. Types of tickets: you can buy tickets for 1 trip, 2, 20, 40, and 60 (tickets can be shared). There are also other types of tickets although they are meant more for residents and less for tourists. Children up to 7 years old do not have to pay for a ticket. 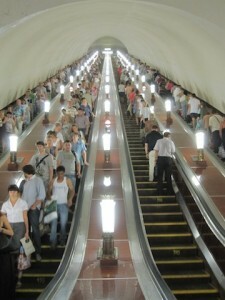 I am going to explain in the simplest way possible explain how to travel via the Moscow Metro. If you are accustomed to travelling via the Metro in other cities, many of the issues that I go over here will seem obvious to you, others perhaps not as obvious. A series of doors with green signs through which you can Access the Metro that say “Metro Entrance” in Russian. Another series of doors with red signs that say ‘Do not enter” that are the exit doors. Once you go in you will see that there is a large Metro map in the hall of each station, along with automatic machines that dispense tickets and a ticket booth. Automatic dispensing machines. They are in Russian and English and are not difficult to use. Ticket booth. 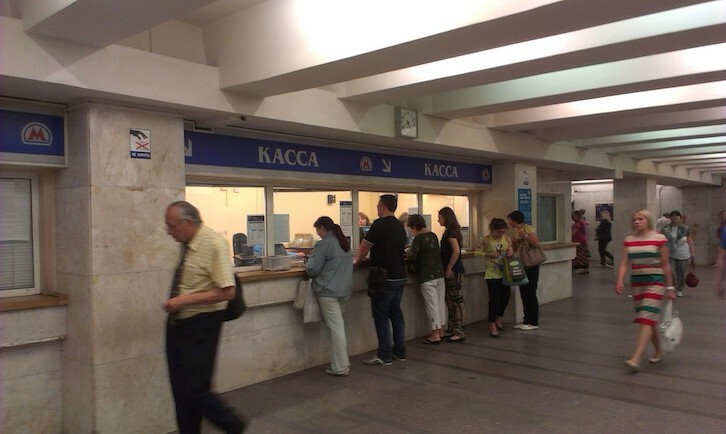 Although it is not hard to use the machines, it is much more comfortable to use the ticket booth manned by a person (they are marked with the Word “KACCA”). Get in line (if there is one) and wait your turn. At the ticket booth you can buy tickets with needing to know a Word of Russian. You just need to lift your hand and hold up the number of fingers for the number of tickets you need (1, 2, 20, 40). After paying, the cashier will give you a card that will serve as your ticket. VERY IMPORTANT. You can buy a ticket for 20 trips and share it with other people. It is not necessary for each person to have their own ticket. From the ticket sales area, you will see turnstyles where you can enter the Metro that come with a card reader (in some stations they are older and in others they are more modern). You should go through the turnstyle and put your card on the cardreader. You will see the light change from red to green indicating that you can go through. The screen of the reader will show you how many trips you have left (if you are utilizing a 20-trip card, the screen will read 19). Once you have gone through the turnstyle, you will see an escalator that will take you down deeper underground (stand to the right on the escalator in order to allow people in a hurry to pass). When you arrive down below, there will be signs indicating the lines and the direction they are travelling in. In this moment it is important to be aware if signs are in Russian and in English, as they are often in Cyrillic (in some of the more central stations, they can be translated). Trains pass practically every 1-2 minutes, so if you hear a train arriving it is not necessary to run because another train will pass by shortly. Once the train arrives, you should simply wait for people to exit before getting out. During rush hour there can be a lot of people, so be careful not to get pushed around too much. The most important thing is to get to the doors and get on board while they are open, since the doors close hard. Once inside the train, look for somewhere to sit or stand somewhere where you can hold onto on of the bars, since the trains can move around a lot. The train cars are generally pretty old and loud. 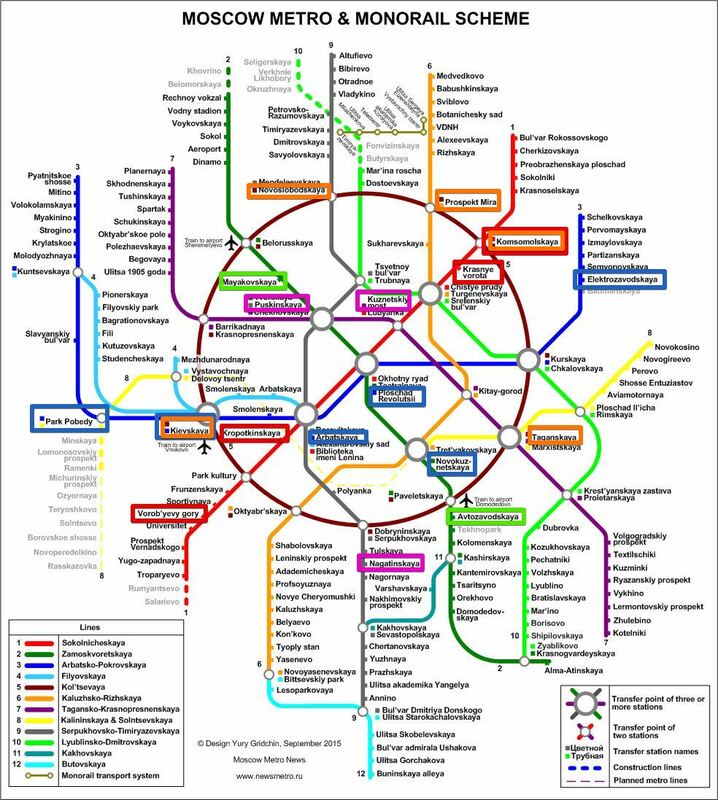 If you do not read nor understand Russian, you will have to consult your map of the Metro and count the number of stops in order to arrive at your destination. In each car, next to the door, there is a map of the Metro and a map of the line on which you are travelling. The announcements on the train are only in Russian. In general, the announcement of the next station will be read out by a man’s voice on the trains travelling to the center of the city and by a woman’s voice on the trains travelling away from the city center. On the circular line (the maroon colored line 5) a man’s voice indicates the stops if it is travelling in a clockwise direction and in a woman’s voice if it’s travelling counter clockwise. You will also see that each station has signs with its name posted but they are in Russian and can be difficult to see from inside the train. If you have to switch trains, after exiting the train you should look for signs for the lines that you need to take. These signs are in color (each line has its own color) and are very easy to follow if you know the color of the line that you need to take. Switching lines can involve going up or down either stairs or escalators and passing through underground passageways. 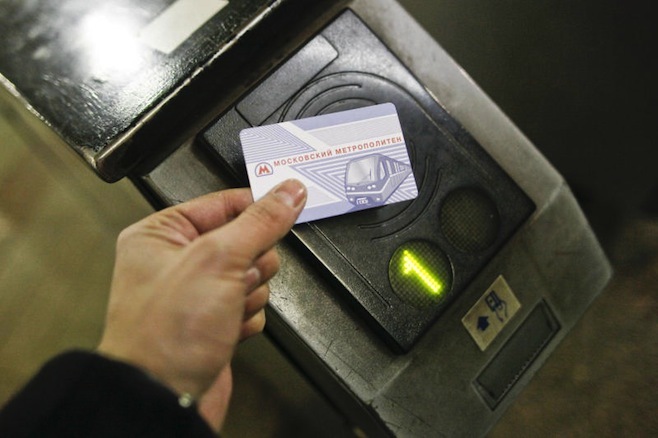 You can change trains as you desire on a single ticket, which is valid until you exit the Metro system. If you miss your stop, it’s not a problem. Trains go in both directions. Simply get off and take the train going in the opposite direction. Once you have arrived at your destination, simply leave the train and look for the white sign with black letters that says “Exit to the city” via the escalator up. You can exit via several exits to the city. Look for the exit most appropriate to your final destination. In the second classification there are 46 stations with 4 stars (“beautiful stations”). If you have time and want to, you can also visit some of these. You can see them by following this link. If you have a question, suggestion, comment, or if you want to share your experience, you can use the form below. If you want to, you have the buttons below to use to share this entry. Doing so will help me a to reach more people. Thank you for reading.